Benefits of Cauliflower - Although it does not have fresh and attractive colours like other types of vegetables, the benefits of cauliflower are many. This pale vegetable is rich in vitamins and minerals and benefits that can nourish your body. Cauliflower contains antioxidants, fibre, potassium, isothiocyanate (including sulfur compounds) and folic acid which is quite high. This content can help prevent various diseases, and improve and help the growth of body tissues. If you're going to have a lean body or have a healthy weight, cauliflower can be the solution. With a high enough fibre content, cauliflower is the right choice for your diet. Not only broccoli can help you reduce the risk of cancer, but cauliflower also contains nutrients needed to protect the body from disease. Cauliflower contains phytonutrients, antioxidants, sulforaphane, and indole-3-cardinal which can help reduce cancer risk. In 100 grams of cauliflower, there is at least 15% of the content of vitamin K. The content of vitamin K can help maintain bone health. Vitamin K can increase calcium absorption and bone density, so it is expected to reduce the risk of osteoporosis and fractures. Benefits of Cauliflower - Cauliflower is not only rich in fibre, but it also contains water. Both of these ingredients are well known for preventing constipation and maintaining the health of the digestive tract. 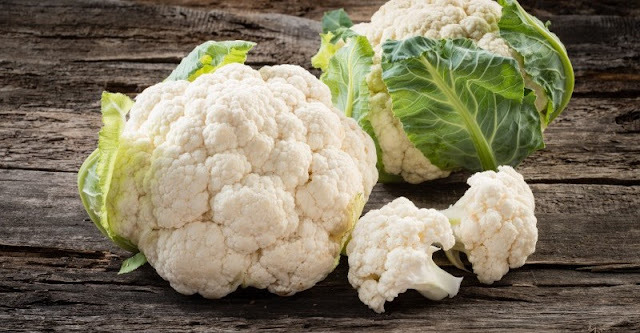 Apart from those mentioned above, the benefits of other cauliflower are to help improve memory, reduce cholesterol levels, reduce blood pressure, increase insulin sensitivity, and reduce the risk of heart disease and diabetes. Now you know the benefits of cauliflower, don't you? Come on, take advantage of cauliflower by enjoying it in a variety of preparations. One of them is processed sauteed cauliflower below, which you and your family can enjoy together. First, cut the cauliflower and steam for about 4 minutes. Set it aside. Heat fruit oil in a frying pan, then saute the shallots and leeks with salt and squeeze the lemon until fragrant. Add the cauliflower pieces, then add enough water, salt and fresh pepper to the frying pan. Saute until cooked in medium temperature. Lift and ready to be served. Cauliflower is proven to contain many nutrients that are important for body health. Also, cauliflower is also easy to cook as a healthy dish. So there is no reason not to put cauliflower on your list of healthy menus every day. 0 Response to "Benefits of Cauliflower Not as Pale as the Color"